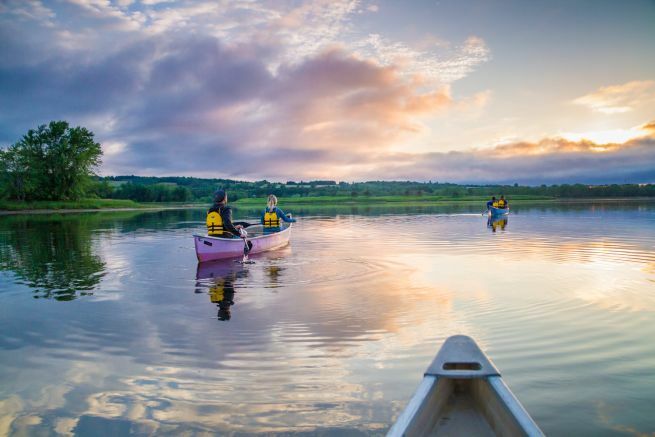 See how Nova Scotia adventurers A for Adventure get away from it all in the heart of the city. At A for Adventure, we’re all about connecting with nature, going on sweet adventures and sharing and inspiring others to do the same. We love getting ‘away from it all’ and exploring places far from city limits. But what if you can have both? Fredericton has tons of amazing craft breweries and trails that connect them. First, we went over to The Radical Edge bike shop to rent a couple bikes (and grab a delicious espresso). They offered some tips on the best routes and we even met some locals at the shop that ended up being our tour guides! We hopped on our bikes and hit the trails in search of some tasty brew. Our first stop was across the bridge at the amazing TrailWay Brewing Co. Oh man, was this beer good! After that, we jumped back on the trail and zipped over to the Picaroons Roundhouse location. Not only did they have great beer on tap, but we also had some delicious appetizers. After that, we took the incredible Bill Thorpe Walking Bridge (an old railway bridge) across the Saint John River for a quick stop to enjoy the view from Lighthouse on the Green, then finished our night with more great beer, food and relaxing on the patio at Graystone Brewing. Not many cities have a 673-km (418-mi.) river that runs through it - Fredericton does, and it’s perfect for canoeing (more on that later), kayaking, boating, fishing or just enjoying the view. In this case, we rented stand-up paddleboards from Second Nature Outdoors and got a guided history tour down the Saint John River. It was pretty sweet being right in a major city and floating down a river with friends as the sun goes down. It didn’t hurt that it was a beautiful, calm evening with a spectacular sunset, either! This was a highlight. We got up extra early to be on the water for sunrise and we were rewarded! The Saint John River was calm, all was quiet, and as the sun came up over the islands the reflections on the water were incredible. This location was just 10 minutes from downtown Fredericton, which is hard to believe because it feels like you’re in the middle of nowhere. We rented our canoes from Second Nature Outdoors, which has a second location right at the Hartt Island RV Resort. As we paddled around the islands we saw eagles, ospreys and tons fish jumping out of the water. Located in the heart of Fredericton, this farmers market feels like the heart of Fredericton. And on a hot summer morning, the place was packed with vendors and people. Fresh veggies, fruit, meats, drinks, flowers, art, music, food - if it’s local, it’s here! We strolled around the market, people-watched and enjoyed some fresh fare. This has to be one of the best markets we’ve ever been to - chapeau Fredericton! It’s only 20 minutes from downtown Fredericton, but you’re going to want to give yourself some extra time to explore this living history site. We walked around by guided tour of the over 70 historic buildings (we didn’t get to all of them! ), but we did find the pub! The King’s Head Inn is an English-style pub with a local beer on tap and traditional (and modern) food served upstairs. There’s lots to see and do and it would be a great place for the kids, too. A for Adventure is all about inspiring people to get outdoors and be adventurous. Follow along with Jan LaPierre and Chris Surette as they share all the wonderful things to do in Canada’s great outdoors.